Malaysian Food Pyramid is a simple guide for individuals to vary their foods intake according to the total daily food serving recommended. A balanced diet contains the combination of foods that will provide all the nutrients needed by our body. There is no single food that will provide us with the all nutrients needed. The body needs many types of food in varying amounts to maintain health. A food pyramid consists of four (4) levels that represent five (5) food group. Indicated beside each food group is the recommended number of servings per day from each group. 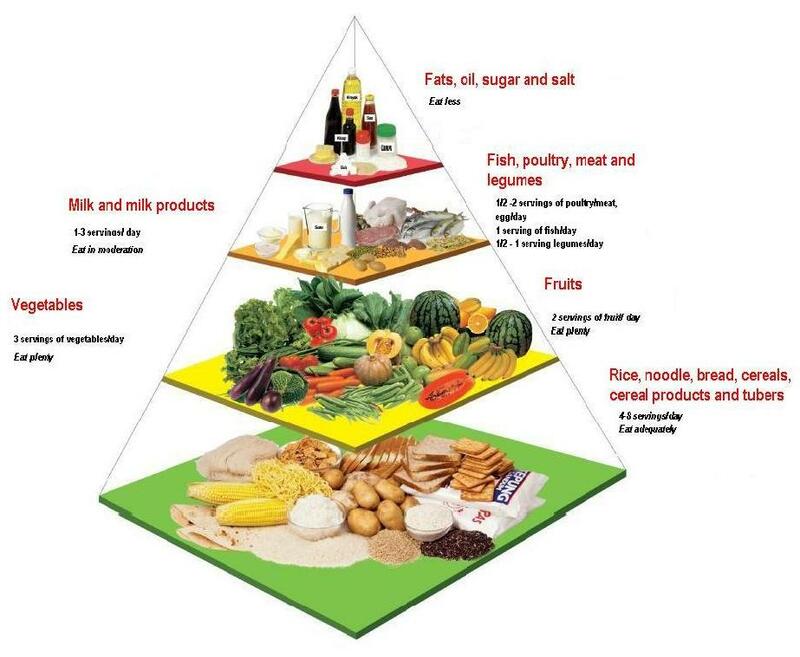 From the bottom to the top of the food pyramid, the size of each food group becomes smaller indicating that an individual should eat more of the foods at the base of the pyramid and less of the foods at the top of the pyramid. 1 – 3 servings of milk and dairy product. Main source of carbohydrate which provides energy (50 – 55% of total daily energy). A great source of vitamins and mineral and dietary fiber. Dietary fibres provide many beneficial effects such as regular bowel movement, good gut health, lowering cholesterol and blood glucose. Choose grain products from whole grain such as wholemeal bread, brown rice, oats and barley. Whole grain contains more fibre. Eat 4 to 8 serving in a day. Good sources of fibre, vitamins and minerals and phytochemical, which help strengthen the immnunity. Eat plenty of fruits and vegetables everyday. Beneficial in health especially in preventing several chronic diseases such as diabetes mellitus type 2, cardiovascular diseases and certain cancers. Eat a variety of vegetables and fruits every day. Vegetables can be fresh green leafy vegetables, other fresh vegetables including various coloured vegetables including fruit vegetables, been vegetables, ulam, canned and frozen vegetables. Choose fresh fruits. Fruit juices may replace not more than one serving of fruit. 1 cup of ulam, raw. 8 whole small of grapes. Good sources of protein, the body’s building block. Rich in vitamin B, iron, folate and zinc. Legumes are generally good sources of protein and also count as s stachy food that can serve as excellent sources of dietary fibre. Legumes also low in fat and contain no cholesterol as compared to meat and poultry. Legumes are encouranged to be consumed daily. Choose fish more frequenlty – if possible daily. Choose meat and poultry that are low in fat and cholesterol, for example remove the chicken skin before cooking or choose lean meat. 1 ½ glasses of unsweetened soya bean milk. High in protein, rich in calcium and wide range of minerals and vitaminsuch as vitamin A, riboflavin, vitamin B12 and zinc. Milk builds strong bones and teeth and maximises bone gain from an early age. This can help prevent osteoporosis later in life. Milk and dairy products should be consumed everyday and whatever age. Consume 1-2 servings a day. 4 dessert spoons of milk powdered, heaped. Located on the crest or top of the pyramid shows these foods should be taken in small amounts only. Excessive intake of fats, oil, sugar and salt can contribute to higher risk of chronic deasease such obesity, diabetes mellitus, cardiovaskular diseases, hypertension and cancers. Limit intake of foods high in fats, oil, sugar and salt and minimise the use of fats, oil, sugar and salt in food preparation. 1 Suitable for sedentary women and older adult. 2 Suitable for children, teenage girls, moderately active women and sedentary men. 3 Suitable for teenage boys, active men, very active women and underweight men and women. Ministry of Health (2010). Malaysian Dietary Guidelines. Nutrition Division, Ministry of Health Malaysia, Putrajaya.